It's only Wednesday, and I'm on Patrice's Porch. 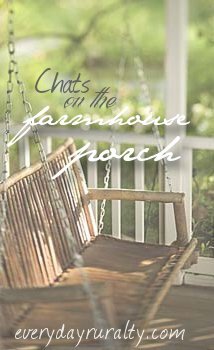 Grab a chair and enjoy our wee chat. Well, I do love my soups! My favourite ... as I race through all the soups in my mind ... may be leek and potato. Oh, hang on. It may actually be Scotch Broth. Yes. On a winter's day, a bowl of Scotch Broth with fresh, warm bread is just what the doctor ordered. Do you prefer a movie or a play? Er... a play? You mean, like with a stage and actors and stuff?? Ahem - this is Lewis. I've never seen a play, unless you count kids at school doing Jack and the Beanstalk, or something similar. And movies come on DVDs and get watched in our Family Room. Is that what you meant? Oh boy. This is tough. It's not that I cannot think of the most unusual birthday celebration I've ever had. It's not even that I cannot think of the best birthday celebration I've ever had. I simply cannot think of any. My birthdays normally come and go like any other day. Is that really sad? My next birthday will be my 45th. Is that a special one? Do you think I ought to put in some request? Depending on the day of the week, I may just decide to put my feet up, and have others do all the housework and food for the day. And all the kids can have a day off schooling. Right, I've just gone for a look: my birthday is on a Friday. I may do the whole spoil-me-for-a-day routine. On the other hand, I will have to run the kids to swimming. And do the shopping. And make dinner. Ask me nearer the time - I'll let y'all know how it's looking. What position were you in your family- oldest, middle, youngest, only? Middle. My brother is 3 years older than me. I adored him when I was growing up. He was my hero. My sister is 6 years younger than me. That gap is nothing now, but it's too big a gap when you're young. She was the cutest wee thing imaginable. She had blonde curls, and was so photogenic. We laugh about the photos mum and dad have. My brother was the first child, so there are loads of him. A whole album devoted just to him. My wee sister was cute and photogenic, and loved the camera. Or maybe the camera loved her. Or was the adoration mutual? Yes, I believe it was. Polaroid cameras had been invented too, so there is a shelf full of albums with photos of her. Me? I think there are a couple of photos of me dotted here and there. But only if I'm holding my baby sister, or being held by my big brother. Do you think it's given me a complex? Actually, to this day, both my brother and sister are so photogenic, and I, er, am not. I like to dwell on the photogenic-ness of them as opposed to me, cos I like to blame the camera for them always looking good, and me.... well, let's just say, they got the looks in our family! Me? I got...I got... I'm sure I got something. Get back to me on that one too. I'll think of something. I will think of something. Er... never heard of this one! You want me to make a wish? A serious one? I wish for all my children to be saved. Each one to be brought into the City of Refuge, under the protection of the blood of Christ. A lighthearted one? I wish...our mortgage was paid. Too big an ask? Okay... I wish ... to see my friend in Virginia. Either in Virginia, or here in Scotland. 'We will fight them on the beaches....'. Guess what? I was in tears. Pass-me-the-tissues type tears. Of course, my children mock. Oh, how they mock! But really, they don't make speeches like this any more. In fact, they don't make leaders like this any more. Well, Patrice, I've loved having another natter with you. I'm off for a wee wander around your farm. I feel like I know all your animals, but I realise they don't know me, so I'm gonna introduce myself. Do you think they'll understand my accent? I guarantee they'll never have heard any like it before now. And if I could make a wish........it would be to come to Scotland. I am praying that-just maybe on this side of heaven. Ah, it sounds as though you may be raising a speech-maker like that!..and I wouldn't be surprised if you were raising a leader like that! I imagine, in God's plan, DR may be training for quite a different stage than Churchill's, but certainly for an eternally important role! I enjoyed the visit! My animals would understand you quite well. I like your wishes- both. If you do get your wish about seeing your friend in Virginia I would drive to meet you. Does she have a porch? I think I'd have to take you to see a play. I have seen my share of ones with children, but the other kind are fun too. We only watch movies on DVD, since it's cheaper and far more convenient. I think Scotch Broth sounds lovely. I understand when you wrote about family pictures. My oldest sister has a beautiful, elaborate photo album, my next sister has one that is very good. My parents bought the book. Put together the first few pages and then stuck the rest of the pictures and memorabilia in the book and returned it to the box. I guess I'm supposed to assemble it myself! lol- I think. We are close to a theater, but movies are mainly watched in our family room as well. I love a good tomato soup and the Scotch broth sounds lovely. Great answers and quite entertaining as well! As for your birthday, go for it! How many times do we actually get a chance to pamper ourselves? Oh, sweet answers. Looking forward to getting to know you better. Visit me if you get a chance at Wise Old Owl!!! HOPE you have a great rest of the week!!! Could you share your recipe for scotch broth? I'll trade you a beef recipe. :) From reading your Blog as a long-time lurker, it sounds as though I am as enamored of Scotland as you are of America. Oh yes, please DO tell us about Scotch Broth! After listening to the video on your blog I just had to share this because it has rekindled memories...Imagine the scene half an hour after taking off from Glasgow airport en route to Toronto, we've broken through the clouds into the lower reaches of the stratosphere to see out of the window the most relaxing shades of blue and white light you ever saw with the white clouds beneath you and leaving all behind (DR asleep by this time!) so I stick the ipod on playing..."Ludovico Einaudi Nuvole Bianche"...It really doesn’t get any more relaxed than that! :-) aahhh memories memories. I am getting waaay to nostalgic in my old age! So nice of a visit. You write about things I have read about in books so it always is so interesting. Do you know the same thing happened when my kids were saying the Declaration of Independence out loud, I just cry every time.